bl.uk > Online Gallery Home	> Online exhibitions	> Asia, Pacific and Africa Collections	> Kupuldhara Tulao, Benares. 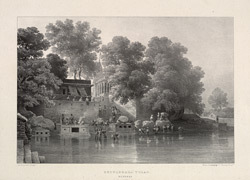 Plate 2 from the third part of James Prinsep's 'Benares Illustrated'. Prinsep (1799-1840), an antiquary and colonial administrator was assay master at the Benares Mint between 1820-30. The lithographs published in this collection were based on his original sketches of the various views of the 'holy' city of the Hindus. Of this plate he writes: 'This is one of the numerous resting places in the panch-kosee jatra, or peregrination of the via sacra which encircles the consecrated ground of the holy city, and is supposed to measure five coss or ten miles in length. It is merely a small tank to the north-west of the town, beyond the Burna Nala provided with a dhurm sala, or lodge for pilgrims, attached to a temple in the usual style of architecture, dedicated to the communication of one of the feats of Shiva, when he designed to vist his favourite city...The annual nahan or bathing at this spot, continues for the whole month of Kartik...'.